We’d love your help. Let us know what’s wrong with this preview of The Red Ribbon by Lucy Adlington. As fourteen-year-old Ella begins her first day at work she steps into a world of silks, seams, scissors, pins, hems and trimmings. She is a dressmaker, but this is no ordinary sewing workshop. Hers are no ordinary clients. Ella has joined the seamstresses of Birken Rose, Ella, Marta and Carla. In another life we might have all been friends together. But this was Birchwood. To ask other readers questions about The Red Ribbon, please sign up. Birchwood - more commonly known as Auschwitz, is where we meet 14 year old Ella, starting her first day as a seamstress in The Upper Tailoring Studio, making beautiful dresses for Officers wives and female Guards. Ella was snatched from the streets on her way home from school. She was walking in the gutter at the time, because as a Jew she wasn't allowed to walk on the pavement. In Auschwitz she is a non - person - insignificant, names are not allowed, everyone is identified by a number. She soon Birchwood - more commonly known as Auschwitz, is where we meet 14 year old Ella, starting her first day as a seamstress in The Upper Tailoring Studio, making beautiful dresses for Officers wives and female Guards. Ella was snatched from the streets on her way home from school. She was walking in the gutter at the time, because as a Jew she wasn't allowed to walk on the pavement. In Auschwitz she is a non - person - insignificant, names are not allowed, everyone is identified by a number. She soon discovers that to stay alive she must work hard, but with watery coffee for breakfast and watery soup for supper it's difficult to maintain the energy needed to keep going. Some prisoners ( or Stripeys as they are known ) are much worse off, having the same meagre diet but with really hard physical work to carry out. However if a Stripey doesn't prove their worth they are put on a List, and everyone knows that those on the List are taken away and never seen again. This a place where it's not just the Guards that you have to watch out for though, as there is a hierarchy among the Stripeys, and each hut as it's own boss who rules over the others. Ella becomes friendly with some of the other girls in the sewing room, but her special friend is Rose. Rose irons the clothes in the sewing room, and is an eternal optimist, she loves making up magical stories to help them escape the reality of where they are. The girls talk about owning their own dress shop when all this is over, but there is no certainty any more, just hope, that's all they have - hope. This is a lovely story of two friends just trying to survive one of the darkest periods in history. It was well written in a sensitive manner, and the main protagonists were engaging. We're all aware of the unspeakable things that happened in Auschwitz, but because 'The Red Ribbon' falls into the YA genre we're spared the details. On arrival at Auschwitz, families were separated - wives from husbands, babies torn from their mother's arms, and if just one sentence in this book epitomised this horror for me, it was this - 'There - already sprinkled in dust - a single shoe - for a baby's tiny foot'. Can't add anything after that. 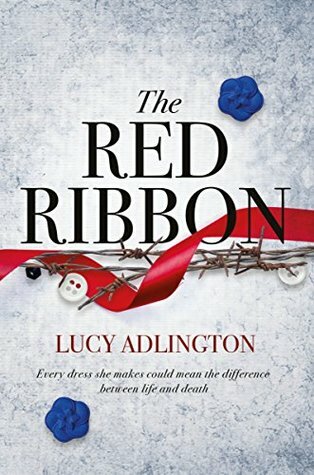 "The Red Ribbon" by Lucy Adlington was a truly eye opening read, which I'm not sure if 'enjoy' is the right word but I thoroughly devoured this book in a day and found it a very emotional but enjoyable read. Knowing nothing about the seamstresses of Auschwitz or even that clothes were made for the Officer's wives and female guards of the camp I was very intrigued by this and quite surprised that this even happened. Although this is not a truly harrowing book it does still get the facts across dur "The Red Ribbon" by Lucy Adlington was a truly eye opening read, which I'm not sure if 'enjoy' is the right word but I thoroughly devoured this book in a day and found it a very emotional but enjoyable read. Knowing nothing about the seamstresses of Auschwitz or even that clothes were made for the Officer's wives and female guards of the camp I was very intrigued by this and quite surprised that this even happened. Although this is not a truly harrowing book it does still get the facts across during the story of the atrocities that happened during the war but it is a much more suitable read for younger readers or people not wishing to be exposed to really distressing and disturbing events. It's still a very saddening and emotional read and I truly had goosebumps when I finished the last few sentences, just showing how well the author conveyed the emotion and sensitivity of the story. Fourteen year old dressmaker Ella starts her first day working at 'Birchwood' (Auschwitz-Birkenau) in the Upper Tailoring Studio, but this is no ordinary workshop with ordinary clients. Every dress made could be the difference between life and death. Everything is now about survival. I loved Ella, her immaturity excused her bolshy behaviour at times and Rose, delightful graceful Rose - survived by living inside her lovely and creative mind in fantastical dreams and far away places - she ensured she captured her friends in her imagination too when they were in dire need of encouragement to keep going. The author admits her aim was to allow us to revisit a time in our past that clearly and categorically happened, highlighting the possible moral choices the inmates had to choose about surviving and thriving and show how acts of kindness can be seen as heroism. She certainly achieved this and you could fully understand the decisions made when it was a choice of life or death. The hope for liberation was heartbreaking and you truly hoped all the characters would make it out when war was over. I very much felt I was there in the camp with the girls, listening to the sewing machines whirring and Marta shouting 'pins!' An excellent read that without a doubt makes you stop and think about how many suffered during the holocaust and just how a good life we have now. Truly wonderful, The Red Ribbon is the story of the friendship between 2 teenage girls who worked in the dress shop at Birkenau. It is not based on any true story, but incredibly there was a haute couture factory shop there for the commandant's wife and female guards. The prisoner guards chose only the best seamstresses and created gorgeous dresses, all the while being starved, tortured, and beaten. There is so much love and beauty in this story that it is hard to believe it takes place in such Truly wonderful, The Red Ribbon is the story of the friendship between 2 teenage girls who worked in the dress shop at Birkenau. It is not based on any true story, but incredibly there was a haute couture factory shop there for the commandant's wife and female guards. The prisoner guards chose only the best seamstresses and created gorgeous dresses, all the while being starved, tortured, and beaten. Leila This book sounds really interesting Beverly. I like your review very much. Julie incredibly there was a haute couture factory shop there for the commandant's wife and female guards. Good Lord. . . the info that keeps on coming, out incredibly there was a haute couture factory shop there for the commandant's wife and female guards. A beautiful tale of friendship, kindness and love within the harrowing camp of Aushwitz-Birkinau. I really love reading Holocaust literature -- I think that we have a duty to at least TRY and understand what happened in the second world war. We need to try our best to empathise, despite the fact that this not only seems but IS impossible. We never learn how old Ella is because she lies about her age, but she is a young (under 16) Jewish girl with a passion for dressmaking. After securing a job i A beautiful tale of friendship, kindness and love within the harrowing camp of Aushwitz-Birkinau. We never learn how old Ella is because she lies about her age, but she is a young (under 16) Jewish girl with a passion for dressmaking. After securing a job in the sewing rooms, she starts making dresses for the commander's wife and female guards, a task which helps her to escape from the cruel chaos which surrounds her. The Red Ribbon is an emotional, poignant and incredibly well-written YA Historical Fiction that I was just looking for. Set during the end of WW2, in the concentration camp Birchwood, it follows two young girls called Rose and Ella. Both have been arrested and start work in the tailoring workshop controlled by Marta, brutal and angry. Ella has a passion to have her own dress making shop but with no freedom, that is only a dream. She and Rose cross paths with Carla, a guard who looks nice but has The Red Ribbon is an emotional, poignant and incredibly well-written YA Historical Fiction that I was just looking for. Set during the end of WW2, in the concentration camp Birchwood, it follows two young girls called Rose and Ella. Both have been arrested and start work in the tailoring workshop controlled by Marta, brutal and angry. Ella has a passion to have her own dress making shop but with no freedom, that is only a dream. She and Rose cross paths with Carla, a guard who looks nice but has multiple personas. The imagery from the writing style was clear to see as I read on, wanting to find out if the girls survived and were liberated from the camp. I think the novel was well-researched and overall, left me blown away by how much I enjoyed it. The Red Ribbon is a touching, emotional and shocking story, set in the concentration camps of WW2, but showing a different side of the camps. Not a nicer side, mind you, but definitely a little different to what we often read about or see in films – I knew nothing about the seamstresses and clothing studios of WW2 concentration camps before I read this novel. The story centers around Ella, who has just started a new job at a sewing studio – in Auschwitz. It’s a truly shocking story at times, and at other points it’s quite sweet and touching as we see the relationship between Ella and her best friend, Rose. It also feels very poignant when Ella thinks back to life before the war, and about her family; you really feel for her and can’t imagine the horror. She’ll drop thinks into the story really casually – like she was picking lice off the seams of her dress, for example. This really shocked me – I re-read it twice – even though there were other horrible things happening. It made my skin crawl! It’s just one of the ways Lucy Adlington illustrates the horrible living conditions for Ella and the prisoners around her. I loved both Ella and Rose; they were both really sweet in their own ways, though Ella could be a very headstrong at times and at first I have to admit I found her a little annoying… Rose was also so likable, trying her hardest to create an imaginary world around her to attempt to block out the horrors taking place there. I don’t read a huge amount from the Young Adult genre and was surprised to see that The Red Ribbon is classed as YA – I hugely enjoyed it, anyway. The book itself is so aesthetically pleasing – it would make an amazing gift. Each page features illustrations of ribbons, scissors and pins, and the cover is beautiful! This provides a strong contrast compared to the stark, colourless world of Auschwitz. This is a powerful novel of friendship, determination and desperation which I would recommend to anyone. It’s not an ‘enjoyable‘ read as such, due to the subject matter, but I think it is an important one. From beginning to end, and everything in between, The Red Ribbon is truly unforgettable. It’s nurtured with a sensitivity and thoughtfulness that encourages hope, even in the darkest of places. The contradiction of captives wearing their shapeless, faded uniforms while sewing exquisite clothes to adorn their captors provides an opportunity for both admirable and shameful attitudes to surface. Chapter headings of specific hues emphasise the stark contrast to the otherwise colourless and heart-wre From beginning to end, and everything in between, The Red Ribbon is truly unforgettable. It’s nurtured with a sensitivity and thoughtfulness that encourages hope, even in the darkest of places. The contradiction of captives wearing their shapeless, faded uniforms while sewing exquisite clothes to adorn their captors provides an opportunity for both admirable and shameful attitudes to surface. Chapter headings of specific hues emphasise the stark contrast to the otherwise colourless and heart-wrenchingly grim world of Birchwood – also known as Auschwitz. The headings themselves are tailored to draw inspiration from the vibrant fabrics being bought to life, the natural landscape, and prisoners’ distant memories, all of which are cruelly divided by barbed wire. The implications for those in camp whose arduous work duty is considered a privilege are balanced with optimism as distinctive of one of young Ella’s designs, without ever losing touch with the reality that war has literally stamped upon them. These prisoners are acutely aware that their only reward is being allowed to exist for another day simply because they were ‘useful’, appreciating that any extra time could bring them one step closer to freedom. I’m ashamed to admit that it took me a while to warm to Ella. She appears selfish, quickly identifying with her situation and manoeuvring accordingly to ensure SHE was one of the ‘useful’ ones and could hold on to her dreams and the future. As I read on I began to ask myself, “what was the alternative? Would others give way for her?” The roots of her self-preservation not only grow stronger but become an anchor for others and I realised it would be impossible to comprehend anything under those circumstances, except that first impressions can be deceptive. I can’t leave without saying how this wonderfully expressive and moving read is presented as the most elegant hardcover I have ever seen. Its pages display traces of sewing embellishments like buttons and pins, and even the symbolic red ribbon itself leaves a visual impression as it swirls through the printed text. I loved reading Red Ribbon because I found many things that were the same in Red Ribbon, that was a long time ago the same things in my own childhood. I related to the girls working on the sewing machines. My aunt used to work in a very small place sewing baby bibs and rubber pants.The scene in Red Ribbon about Grandma's house stunk of fish for days after, brought back my own memories. When I used to stay with my nan we visited my great Nan taking her kippers. It's strange because I now clearly I loved reading Red Ribbon because I found many things that were the same in Red Ribbon, that was a long time ago the same things in my own childhood. I related to the girls working on the sewing machines. My aunt used to work in a very small place sewing baby bibs and rubber pants.The scene in Red Ribbon about Grandma's house stunk of fish for days after, brought back my own memories. When I used to stay with my nan we visited my great Nan taking her kippers. It's strange because I now clearly remember that my great nan's place always used to smell of kippers.I loved the way the author Lucy Adlington brought to life Marta the boss in being razor sharp and extremely bossy. Pay attention her bossiness came across it scared even me reading about her. There's a lot more involved in Red Ribbon to read about. But I don't want to spoil it for any reader who is about to start the journey into reading Red Ribbon. Πρόκειται για ένα συγκινητικό, ρεαλιστικό, ωμό και ταυτόχρονα λυρικό και τρυφερό μυθιστόρημα, που περιγράφει τις βαναυσότητες του στρατοπέδου, τις απάνθρωπες συνθήκες κράτησης, τους εξευτελισμούς και την εξόντωση εκατομμυρίων ανθρώπων. Η δεκατετράχρονη Έλλα, που έμαθε να ράβει και να σχεδιάζει ρούχα από την ταλαντούχα γιαγιά της, καταφέρνει να χωθεί στο Ατελιέ του στρατοπέδου ως κοπτοραπτού κι εκεί γνωρίζει τη Ρόουζ. Η Έλλα είναι ρεαλίστρια, σκληρά εργαζόμενη, με παρατημένα όνειρα, χωρίς να έχει διαβάσει ούτε ένα βιβλίο στη ζωή της, μάλιστα μιλάει απαξιωτικά γι’ αυτά τα «παραμύθια». Η Ρόουζ, πρώην κόμισσα, αιθεροβάμων και ρομαντική, κόρη συγγραφέως που δεν υποστήριζε «Αυτούς», γι’ αυτό και συνελήφθησαν όλοι, βουτηγμένη στις ιστορίες και τα παραμύθια, της άνοιξε έναν καινούργιο κόσμο, αφηγούμενη όσες περιπέτειες ήξερε! «Η Ρόουζ είπε ότι οι ιστορίες ήταν ζωή. Εγώ όμως ήξερα. Ζωή ήταν η δουλειά» (σελ. 113). Η Ρόουζ πάντα θα είχε ένα παραμύθι να πει για να βοηθήσει τον νου τους να ξεφύγει από τη βία και τη φρίκη που βίωναν. Παρ’ όλ’ αυτά: «Καμία ιστορία δεν μπορούσε να είναι τόσο μαγική ούτε τόσο θλιβερή όσο η επιβίωση» (σελ. 358). Αυτές οι δύο αντίθετες γυναίκες δέθηκαν και ατσαλώθηκαν μαζί μέσα από τις κακουχίες του στρατοπέδου ενώ συνδετικός κρίκος τους ήταν ένα κομμάτι κόκκινη μεταξωτή κορδέλα, πάνω στην οποία στήριξαν όλες τους τις ελπίδες για ένα καλύτερο μέλλον και μια σύντομη λύτρωση ή απελευθέρωση. Το στρατόπεδο του Άουσβιτς-Μπιρκενάου, όπου διαδραματίζονται τα γεγονότα, οφείλει το όνομά του στην πολωνική λέξη brzezinka που σημαίνει «δάσος από σημύδες», γι’ αυτό και η αφηγήτρια της τραγικής αυτής ιστορίας το αναφέρει ως Μπέρτσγουντ (birchwood). Η αφήγηση ξεκινάει από τη δοκιμασία που πέρασε η Έλλα ώστε να ξεκινήσει να εργάζεται ως κοπτοραπτού στο εργαστήριο ραψίματος του στρατοπέδου συγκέντρωσης που έστησε η γυναίκα του διοικητή, λάτρις της μόδας, γιατί ήθελε να έχουν κομψά ρούχα όλες οι γυναίκες των αξιωματικών και οι γυναίκες Φρουροί. Το γύρω περιβάλλον και η ατμόσφαιρα του στρατοπέδου ξεπηδάνε σταδιακά, κατά την πορεία της αφήγησης, με το κάθε χαρακτηριστικό γνώρισμα να ξεπηδάει από δω κι από κει όσο η ίδια η αφηγήτρια και πρωταγωνίστρια του μυθιστορήματος αγωνίζεται να επιβιώσει σε αυτόν τον χώρο. Τον αναγνώστη καλωσορίζει η σκηνή διαλογής στο Ατελιέ και μετά αρχίζει η Έλλα να περιγράφει το μέρος, τις συνθήκες και το πώς κατέληξε εκεί, καθώς και ποια ήταν πριν από όλα αυτά. Παράλληλα, η προσωπική ζωή της Έλλα, οι αναμνήσεις της γιαγιάς της που την είχε μάθει να κόβει, να ράβει, να σχεδιάζει μα πάνω απ’ όλα ν’ αγαπάει και να αναγνωρίζει το κάθε ύφασμα και το κάθε ρούχο, επανέρχεται στο προσκήνιο είτε για να της δώσει κουράγιο με τα γνωμικά της γιαγιάς της είτε για να την πληγώσει ακόμη περισσότερο, όταν από τις ευχάριστες, μυρωδάτες αναμνήσεις της προσγειώνεται στη δυσοσμία, την ανηθικότητα, τον ξεπεσμό της ανθρώπινης φυλής στο στρατόπεδο συγκέντρωσης. Η Έλλα τότε μάζευε λεφτά βοηθώντας τη γιαγιά για να σπουδάσει και κάποτε ν’ ανοίξει το δικό της κατάστημα ενδυμάτων. Τώρα κάνει τα πάντα για να επιβιώσει. «Δε θα γινόμουν κι εγώ ένα φάντασμα από καπνό που θα έβγαινε από μία καμινάδα» (σελ. 151). Αυτό ακριβώς το ταλέντο, κυρίως μέσα από το βλέμμα και τις ερωτήσεις της Ρόουζ, τίθεται στη διάθεση των εχθρών και γίνεται στόχος ζωής για την Έλλα, με αποτέλεσμα να έχουν οι δυο τους μια συγκλονιστική αντιπαράθεση: «-Θα μπορέσω να κάνω ανταλλαγές για καλύτερες κουκέτες στο μπλοκ ή και για άλλη μια κουβέρτα για την καθεμιά μας, δεν θα το ήθελες αυτό;… -Πραγματικά δεν καταλαβαίνεις πού είναι το πρόβλημα, έτσι; Σοβαρά τώρα, δεν βλέπεις τι συμβαίνει; … Είναι σαφές ότι έχεις ξεχάσει πού βρίσκεσαι και τι ακριβώς συμβαίνει εδώ πέρα -και ποιος ευθύνεται!» (σελ. 133-134). Επομένως, αξίζει να σπαταλάς το ταλέντο σου για τον εχθρό, όσο «αγνά» κίνητρα κι αν έχεις; Για έναν εχθρό που δεν πρόκειται ποτέ να σε δει ως άνθρωπο παρά μόνο σα νούμερο κι όταν δε θα σε χρειάζεται άλλο δε θα διστάσει να σε βγάλει από τη μέση; Για σκεφτείτε το κι εσείς λίγο! Τα απειροελάχιστα «διαλείμματα» που εφευρίσκει, οι μικρές ανάσες που παίρνει, κοντράρονται ανελέητα με τον σαρκαστικό και ωμό ρεαλισμό των συνθηκών κράτησής της. Η συγγραφέας έχει τον αναγνώστη «μια στο καρφί και μια στο πέταλο», με τις αποσπασματικές αναφορές στο παρελθόν, το ρεαλιστικό σκηνικό κτηνωδίας και τις κοφτές φράσεις. Δεν μπορούσα να πάρω ανάσα! «Ακούμπησε τα γάντια της πάνω στα περιοδικά και το καπέλο της στην πολυθρόνα. Το μαστίγιό της το άφησε στη γωνία, κοντά στην πόρτα. Ήμασταν εδώ, σ’ ένα στρατόπεδο συγκέντρωσης για αθώους, που το διοικούσαν εγκληματίες» (σελ. 52-53). «-Κάνεις ό,τι χρειαστεί για να επιβιώσεις, το κατάλαβες;» (σελ. 58). «Οι αρουραίοι που έτρεχαν πέρα δώθε στα δοκάρια της οροφής ήταν παχύτεροι από τους ανθρώπους που ήταν ξαπλωμένοι στα κρεβάτια από κάτω» (σελ. 66). Ειδικά όταν μια σειρά από γεγονότα χωρίζει τις γυναίκες ενώ ταυτόχρονα χάνουν τη δουλειά τους στο ατελιέ, αναρωτιόμουν τι άλλο θα τους συμβεί και πώς θα καταφέρουν ν’ ανταπεξέλθουν αν δεν ξαναβρούν δουλειά (εκεί αν δε δούλευες κάπου ήσουν ήδη νεκρός). Και όλα αυτά με σωστά κατανεμημένες σκηνές γέλιου, δυστυχίας, απανθρωπιάς και ελπίδας. Η συγγραφέας πλάθει ολοζώντανους χαρακτήρες, στήνει ρεαλιστικά σκηνικά επιβίωσης, βάζει τον αναγνώστη μέσα στην ιστορία της και κάποιες φορές του χαρίζει λυρικές εκφράσεις ή νότες χιούμορ, τόσο απαραίτητες σε αυτό το ζοφερό περιβάλλον: «Η προφορά της ήταν ανιαρή -αν μπορούσε να μιλήσει μια πατάτα, έτσι θα ακουγόταν» (σελ. 53). Και: «Το ψωμί είναι καλό, αλλά οι φίλοι είναι καλύτεροι» (σελ. 71). Συγκλονιστική και αφοπλιστική είναι η καταγραφή της ιεραρχίας που επικρατούσε στο στρατόπεδο: τα Αφεντικά, κρατούμενες που συμπεριφέρονταν σαν Φρουροί με σκοπό να γίνουν Επόπτριες, όπως η Μάρτα που ήταν το αφεντικό στο εργαστήρι ραπτικής ή η Γκέρντερ που ήταν το Αφεντικό του στρατώνα τους, δυσχέραιναν ακόμη περισσότερο τις συνθήκες κράτησης ενώ το ίδιο πρόσωπο μπορεί να σου έκανε κάποια χάρη αν είχες τα κατάλληλα ανταλλάγματα. Φυσικά, οι Φρουροί δε χάνουν ευκαιρία να αποδείξουν στις κρατούμενες ποιος κάνει κουμάντο κι ας είχαν συνεργαστεί λίγα λεπτά ή μερικές μέρες πιο πριν! Επίσης η Έλλα, παρατηρώντας τα πάντα γύρω της, καταγράφει τα διακριτικά των συγκρατούμενών της, τα τρίγωνα και τα χρώματά τους. Εβραία και η ίδια, κάνει ιδιαίτερη αναφορά στο αστέρι, «…το αστέρι σήμαινε ότι ήσουν η κατώτερη των κατωτέρων,,, άνθρωποι κατά το ήμισυ» (σελ. 73). Από τις πιο σοκαριστικές σκηνές είναι αυτή που η Έλλα πηγαίνει στο «Πολυκατάστημα» για να ψωνίσει τις παραγγελίες του εργαστηρίου. Στοίβες από ρούχα, γυαλιά, παπούτσια, απομεινάρια μιας ζωής ήταν αυτά που δεν έπαυε η Έλλα στιγμή να κοιτά, να ψάχνει, να εξερευνά. «Δέκα χιλιάδες βαλίτσες την ημέρα. Είναι πάρα πολλές. Δεν τις προλαβαίνουμε», λέει η συνοδός της που δουλεύει εκεί και επεξεργάζεται μαζί με χιλιάδες άλλες κρατούμενες την πρώην ζωή των πρώην ανθρώπων που φτάνουν σωρηδόν στο στρατόπεδο. Τι φρικιαστικό τα προσωπικά είδη των ανθρώπων που μεταφέρονταν στο στρατόπεδο να λεηλατούνται, να ξεχωρίζονται, να κρατιούνται τα πολύτιμα και το ίδιο τρένο να παίρνει τα χρυσαφικά και τα ιδιαίτερης αξίας αντικείμενα σε άγνωστο προορισμό! Αυτό το μέρος υπάρχει ακόμη και σήμερα στο Μουσείο του Στρατοπέδου, με μια μεγάλη ανατριχίλα για όποιον το επισκέπτεται. Μέσα σε αυτό το χάος, με την ήττα να επικρεμάται πάνω από τα κεφάλια των Γερμανών, μόνο ένας άνθρωπος με τα προσόντα και τη δύναμη της Έλλα θα μπορούσε να επιβιώσει, ξεχωρίζοντας την ήρα απ’ το στάρι, ρισκάροντας φιλικές επαφές που ίσως αποδειχθούν προδοσία ή εκμετάλλευση, παίζοντας ξύλο για στοιχειώδη πράγματα όπως ένα σαπούνι ή ένα κομμάτι χαρτί και ταυτόχρονα πασχίζοντας με νύχια και με δόντια να μην περάσει τη διαχωριστική γραμμή που θα την κάνει σαν τους Άλλους, απάνθρωπη και κτηνώδη. «Έραβα ακόμα πιο γρήγορα, λες και κάθε εκατοστό, κάθε βελονιά με κρατούσε ακόμα πιο σφιχτά στη ζωή» (σελ. 99). Τέλος, η αισθητική της έκδοσης του βιβλίου είναι κομψότατη. Κάθε κεφάλαιο έχει ως τίτλο διάφορα χρώματα και στην αρχή του καθενός υπάρχει ένα αντικείμενο της ραπτικής: δαχτυλήθρα, κουμπί, κουβαρίστρα, ραπτομηχανή, καρφίτσες, ψαλίδι ενώ μια λωρίδα υφάσματος αγκαλιάζει τους τίτλους, υπό στενή επιτήρηση συρματοπλέγματος. Η φροντίδα του εκδοτικού οίκου υπάρχει και στο εξώφυλλο που αγκαλιάζει σαν κασετίνα όλο το σώμα του βιβλίου με τα χρώματα και τα σχέδιά του να θυμίζουν τις ριγέ πιτζάμες των κρατουμένων. I think WWII books are very important to read and I don't find myself reading them often even though I have a few on my shelves. This one, unfortunately, was just okay for me. I read it in two months (well, I started it in October then put it down for two months before finishing it) and that's because this story didn't interest me all that much. I was a little bored to be honest. There were moments I liked reading it but most of the time I was reading it because I had to. I did find the story to I think WWII books are very important to read and I don't find myself reading them often even though I have a few on my shelves. This one, unfortunately, was just okay for me. I read it in two months (well, I started it in October then put it down for two months before finishing it) and that's because this story didn't interest me all that much. I was a little bored to be honest. There were moments I liked reading it but most of the time I was reading it because I had to. I did find the story to be unrealistic at times (and happier than what might have really occurred). This book wasn't as heartbreaking as you might expect from a WWII book but I guess it's meant to be read by younger readers? Also, I wished the one sentence where the FMC said she might kiss her best friend would have been developed but that didn't happen. However, I did like the friendship they had. Absolutely stunning - one of the best books I've read in ages. If you ever doubted the importance of clothing - as I have - this will make you question that; in Birchwood, the Stripeys are stripped when they arrive. Everything is taken from these women; their clothes, their hair, their dignity - but they do their best to hold onto their humanity and sense of self, in whatever way they can. Ella is a talented seamstress and along with Rose who becomes her best friend she uses her talents in the s Absolutely stunning - one of the best books I've read in ages. If you ever doubted the importance of clothing - as I have - this will make you question that; in Birchwood, the Stripeys are stripped when they arrive. Everything is taken from these women; their clothes, their hair, their dignity - but they do their best to hold onto their humanity and sense of self, in whatever way they can. Ella is a talented seamstress and along with Rose who becomes her best friend she uses her talents in the struggle to survive the nightmare of Auschwitz. Dressmaking becomes her passport to a little extra bread, an easier indoor job, and opportunity to see vivid colours beyond the grey and brown ash and mud of Birchwood. Lucy Adlington's 'The Red Ribbon' is a very worthy addition to the canon of young adult Holocaust novels and it well deserves its place alongside 'The Boy in the Striped Pyjamas', 'The Book Thief' and the Morris Gleitzman trilogy. It concerns a group of women inmates at Auschwitz who are deployed as clothes makers and is narrated by a young Jewish lady who is deported there in the latter years of the war. I had heard of the musicians of Auschwitz before but not the clothiers although as someone w Lucy Adlington's 'The Red Ribbon' is a very worthy addition to the canon of young adult Holocaust novels and it well deserves its place alongside 'The Boy in the Striped Pyjamas', 'The Book Thief' and the Morris Gleitzman trilogy. I had heard of the musicians of Auschwitz before but not the clothiers although as someone who has visited the concentration camp it is poignantly ironic to contrast the mounds of clothing there with the thin striped outfits the inmates were forced to wear and as the novel shows that some were able to prolong their survival because of their dressmaking skills. Adlington does not shirk from conveying the horrors of such a place but portrays them in a sensitive manner never forgetting her target audience. She also manages to show that even in the darkest of situations compassion, friendship and humanity can never be totally extinguished. Her characters are well drawn, the prose skips along and the novel is cleverly divided into sections represented by a colour. I was particularly moved by the final part with its emphasis on hope and looking to the future without ever forgetting the past rather than on despair and retribution. This is a finely written novel about a delicate subject and one that like two of the aforementioned novels would I have no doubt translate well to the screen. So approaching this book I wasn't sure what to expect, I was hoping for a personal level story not just a retelling of the atrocities. I personally think that the Holocaust is something that should never ever be forgotten. I have read a few books, both fiction and non fiction that are set in this era of history. This book is actually based on facts though it is a work of fiction as are the people portrayed in it. It brings home to you that those horrific acts were carried out on normal people every day people that belonged in families. These people didn't do anything to warrant being treated in the horrendous ways the German army treat them. The background of the cover is a bleak grey/white colour, which I think represents the nothingness of the world the prisoners are forced to exist in. There is a red ribbon as a main feature of the cover and it is twined around some barbed wire. Also on the cover are some different buttons, which have an important significance in the book. The cover also features the byline "Every dress she makes could mean the difference between life and death" which you realise when reading the book that this is a stark truth. Something as simple as one of the female guards, the male guards wives or the Commandants Wife not liking a dress you have made them, or you may have not made it quickly enough could result in you being shot, or worse having you job & it's meagre perks taken away from you. Losing your job could mean a slow death from starvation and heavy back breaking work. I did find the cover interesting and it certainly made me curious about the red ribbon and the pretty buttons and how they were a part of the ugliness of a concentration camp. I felt compelled to read the book, we owe it to both the few that survived and the ones that didn't to read their stories and pass them on to the next generation. I really did feel pulled into this book immediately and it held me captive and on the edge of my seat until the very end. So the books main character is a fourteen year old girl called Ella who is picked up on the street whilst running an errand and taken to Birkenau-Auschwitz. No one has a name anymore, just a number you must remember and be able to recite to any guard or prominent that asks you for it. Ella manages to fake her age as sixteen, as anyone below that age is considered useless and usually ends up either doing back breaking work that kills them or being sent to the "showers". I would describe Ella as being an optimist, always hoping for the best, seeing the good in people. There is very little in her surroundings to find good or hope in but she manages to battle on through whatever is done to her or taken from her. Ella's character, and seeing the awful acts being committed around her give us the reader a very realistic insight into the era covered by the book. Another central character in the book is Rose, who is described as looking like a la-di-da who wears odd shoes, one is a sickly green satin slipper with a metal buckle, the other is a leather brogue with broken laces. The thing that stands out about Rose is she really doesn't care what she may look like. She has shoes to wear and that's fine. Rose ends up sharing a bunk and mattress with Ella. Rose tells Ella all about how her mother is a famous writer, that she will be waiting for her. Rose also likes to make up stories which become a quite popular way the girls while away time until they finally fall asleep in their bunks. They come to rely on each other for hope. Rose and Ella even plan for "after" their time in Auschwitz-Birkenau. They list family they want to see, books they want to read, clothes they wish to make and wear as well as having a dress shop and working there together. They even plan where to meet up, a place which their famous dress shop will be. In the book Ella tells her story of how she came to be where she is, which is Birchwood. Though Birchwood is much better known and most often referred to in history as Auschwitz-Birkenau. A one sentence description of Auschwitz within this book stood out for me "The place where everyone arrives, and nobody leaves." Those people dispatched to Auschwitz soon realise that their lives have changed forever, and to survive, they have to adapt quickly. These prisoners find out that what before seemed trivial can be something that is very important when it is taken away. All prisoners are stripped of all their clothes and possessions and given identical stripey garments to wear, their hair is shaved and the women given a piece of fabric to use as a scarf. Then you are thrown some shoes from a large pile of them, so there's a scramble to get a pair that fit let alone a pair that match. A typical day for Ella began with being woken in her barracks at four thirty am, she had to climb from the top of the three tier damp wooden shelves, leaving her dirty straw mattress behind. With around five hundred women squashed in each barrack block, it meant at least six women to a bunk, with just one mattress shared by at least two women. There was no other furniture in the barracks block, just some toilet buckets. Each Barracks has a "Barracks Boss", who is a prisoner themselves but rules the Barracks. "Bull" is the boss of the Barracks that Ella exists in. With cramped conditions like this it was inevitable that disease, infestations and illnesses spread rapidly. Though being sent to the camp hospital was the last place you wished to be sent as it was rare for anyone to return from hospital. Once up, there was Roll Call.You really was just a number in a list, not a human being. Stripeys had badges made of different colour cloth sewn onto their dresses. The badge showed the reasons why "They" has decided you weren't fit to live in the real, free world anymore, such as a green triangle for bosses. Rose aka Squirrel/Princess has a red triangle which means she is a political prisoner. In Ella's opinion it's crazy, how can Rose be a political enemy!? She was such a dreamy, dipstick, who loved stories. Ella has a gold star, but this gold star was not like one you could receive at school for good work, and to be worn with pride. This star meant you were classed and treated as the lowest of the low, not even a full human, they were treat below human and were totally disposable! At roll call everything had to be perfect, everyone had to look the same, the guards made sure. Ella recalls a woman who had dared to attempt to slick what was left of her hair to try to make herself look/feel better. The guards pounced on this woman who had dared to try to make herself look and feel better and she was punished by being beaten unconscious. This book is packed with incidents where stripeys are put in their place by the guards for the most trivial things possible. There are other jobs available at the camp, such as working in the "washery" or sorting through possessions for valuables and for items that can be reused, or the back breaking work in the surrounding fields. You had to be tougher to work in the "washery" so it is a very big change from working in the sewing room. Ella still refers to those around her in terms of animals. There's Bear, the boss of the washery who is in charge of giving out the specific tasks. Then there's Hyena who assists Bear, they both make life difficult for Ella and Rose insinuating they are "too soft" to do the work. Ella and Rose are given the worst jobs day in and day out but they still remain grateful for the work as it means a little more food at the end of the day as well as another day not having to do the back breaking work that eventually kills you. They do eventually earn the respect of the tougher women in the "washery" too. By faking her age and keeping her eyes and ears open she hears about a job going in the sewing room. There is a kind of frantic race to the sewing room, Ella and a female she names "Rabbit". Rabbit even loses one of her shoes in the process. Those wanting the job have to impress Marta, the Prominent in charge of the sewing room. (Prominent's are prisoners who have been given privileges and power. They have just enough power to rule the other prisoners making the majority of them into successful bullies.) Marta put Ella and Rabbit on trial, they are each given a task. Ella to make a dress from scratch for a blonde client called Carla. Where as Rabbit as Ella names her (is 24 years old, and stutters and shuffles about like a rabbit) is tasked with letting out a designer blouse for a client who doesn't want to admit how plump she is. There is much more to the trial than I have shared but I don't want to giveaway too much, so I'll just say that Ella manages to impress the "Prominent" Marta and her client Carla. The sewing and dressmaking skills Ella has were learnt whilst sitting with her Grandmother end up coming in really useful. It means Ella has a good chance at a relatively good job that is coveted by many. When Ella is in the sewing room her thoughts often stray to memories she made with her Grandmother, such as where her Grandmother is now? If she wonders where she (Ella) is? If Grandmother is waiting for her to return? Ella also asks herself what her grandmother would say or do in the situations she finds herself in. Those employed in the sewing room don't get chance to speak to each other very much, they are their to work and provide a dressmaking service primarily to the Commandant's wife. So when Ella works there she gives her fellow workers names that remind her how they behave. There's Marta, the prominent in charge who loves giving orders, her name is "Shark". The other girls that applied for a job the same day as Ella are "Squirrel/Princess" (Rose) who gets put on trial with Ella. Then there's "Rabbit" who lost a shoe in the race to get to the sewing room as quickly as possible to be interviewed for the vacancy. Rabbit is 24 years old, and stutters and shuffles about like a rabbit. Already working in the sewing room that Ella originally notices is Francine "Frog" who is wide and squat with blobby skin. Ella is quite successful in her sewing and making garments, but with success comes more danger. Though Ella becomes a more trusted prisoner, she has to be careful to act meekly and as expected to act by the guards or she will be immediately slapped down. What is given can quite easily be ripped away. I loved the way the character of Ella shares some of her Grandmothers sayings in the book. They seem to envoke happier memories for her. Grandmothers sayings are things such as, "Clean hands means clean work", "Waste not want not", and "Better than a smack in the eye with a wet kipper". Ella also remembers her Grandmothers advice such as "Don't think failure, you can do anything you put your mind to", "Sorry doesn't butter any bread"and "Cross that bridge when you come to it, or swim the river if you have to". As you will probably have guessed by now Ella was my favourite character, she knew what was happening around her,she could see it and hear it all but to cope she manages to shut the bad things out as much as she can. It is something she has to do to survive. When one door is quite literally slammed in her face she doesn't give up and looks around until she can find another job. Ella is a character that needs to work and keep busy in order to block out the horrors taking place around her. Ella may only be a teenager but she quickly adapts to her surroundings and learn when to speak up and when to turn a blind eye even when she really wants to stand up for herself and those around her. In the unlikely surroundings Ella manages to make both a best friend and other friends, some of which she doesn't realise she has until she is at her very lowest. Ella's best friend is Rose aka Squirrel/Princess. Rose came from a well to do, wealthy family. Rose loves telling stories and claims her mother is a famous author. The actions of those around her lead you to perceive Rose as living in her own little, self created world. Though I would say don't be so quick to judge some of the characters in this book as there are a few surprises. I did grow to love Rose as a character, though she came across as a little "air headed" she truly ends up helping Ella survive when things are tough. I won't go into how the red ribbon comes into the book, but will say it becomes a treasured beacon of hope in an increasingly dark, stark world. For characters I "hated" I would have to choose Marta the head of the sewing room, who takes credit for the hard work of the other girls. Marta also constantly refers to the fact she was "trained by the best. "Also Carla who is a tough guard that enjoys having clothes made for her by Ella. Carla at a couple of points in the book seems to genuinely care about Ella, almost becoming a friend to her. Then Carla also is instrumental in Ella losing her job in the sewing room. As to what I thought about this book it feels wrong describing the book as an enjoyable read because of its subject and content. I think though I have read other books and watched movies on this subject, I still found the book enlightening. The cover piqued my interest, the blurb made me even more curious, I hadn't heard of the "sewing room" at Auschwitz so wanted to know more. It is one of the few books on this subject I have read that is from the point of view of a young female character. It was at times heart-breaking when Ella, is reminiscing about her grandmother, especially the "sewing machine incident" which I won't go into within the review but you will almost certainly know what section of the book I am referring to when you read. Another part of the book I will not go into in detail is the "liberation dress" incident, again the feelings it gives you are a mixture of good and bad, so many tears and a few smiles. I was reading this book through tears at some points, it is a very honest account of such horrific incidents from the point of view of a child torn from her family, no chance to say goodbye and no knowledge to where her family is whilst all this happening to her. I became attached and instantly cared about Ella and what was happening to her as well the sometimes awful choices she was confronted with. I really didn't want to put this book down once I began reading it. I don't know about anyone else but I always read the sections such as acknowledgements, or letters/note from the author. In this book the author Lucy Adlington reveals that the sewing room featured is in fact based on the real one that was based in Auschwitz. Coincidentally the head of the real sewing room was actually called Marta, though the name is the only similarity between the characters. I also discovered that Lucy Adlington is not only a writer but a costume historian, something I find extremely interesting. So I will certainly be checking out other books both fiction and non fiction by this author! Το "Κόκκινη μεταξωτή κορδέλα" είναι ένα βιβλίο που με το που το παίρνεις στα χέρια σου νιώθεις ένα μαγικό συναίσθημα να σε κατακλύζει. Από τις πιο όμορφες εκδόσεις που έχω δει ποτέ, με το βιβλίο να θυμίζει ένα κουτί ραπτικής, βαμμένο στα χρώματα των στολών των στρατοπέδων συγκέντρωσης. Ριγέ, λερωμένο και σκονισμένο σε ορισμένα σημεία, με την κορδέλα του τίτλου αγκιστρωμένη πάνω σε ένα συρματόπλεγμα, όπως αγκιστρωμένες προσπαθούν να κρατηθούν στην καρδιά στην ψυχή των κρατουμένων οι ελπίδες και τ Το "Κόκκινη μεταξωτή κορδέλα" είναι ένα βιβλίο που με το που το παίρνεις στα χέρια σου νιώθεις ένα μαγικό συναίσθημα να σε κατακλύζει. Από τις πιο όμορφες εκδόσεις που έχω δει ποτέ, με το βιβλίο να θυμίζει ένα κουτί ραπτικής, βαμμένο στα χρώματα των στολών των στρατοπέδων συγκέντρωσης. Ριγέ, λερωμένο και σκονισμένο σε ορισμένα σημεία, με την κορδέλα του τίτλου αγκιστρωμένη πάνω σε ένα συρματόπλεγμα, όπως αγκιστρωμένες προσπαθούν να κρατηθούν στην καρδιά στην ψυχή των κρατουμένων οι ελπίδες και τα όνειρά τους. Και κάθε κεφάλαιο έχει για τίτλο του ένα χρώμα. Χρώματα από εκείνα που θα βρεις στα ανάμεσα στα μασούρια μιας μοδίστρας, όμορφα τοποθετημένα και φυλαγμένα. Κλωστές που είναι έτοιμες να κεντήσουν, να ράψουν, ν' αφήσουν τα σημάδια τους με κάθε βελονιά τους. Για πολλοστή φορά, τον τελευταίο χρόνο, βρέθηκα στα στρατόπεδα συγκέντρωσης του Άουσβιτς. Εκεί γνώρισα, ανάμεσα σε δεκάδες άλλους κρατούμενους, δύο νέα κορίτσια που ξεχώριζαν, την Έλλα και τη Ρόουζ. Τόσο διαφορετικές μεταξύ τους, που δεν θα μπορούσα να φανταστώ τη μία να ζει χωρίς την άλλη. Και πράγματι, απ' τη στιγμή που θα γνωριστούνε μέσα σ' αυτή την Κόλαση, οι μοίρες τους θα δεθούν άρρηκτα και η μία θα συμπληρώνει την άλλη, ακόμα και τις στιγμές εκείνες που μοιάζουν να τους χωρίζουν χιλιόμετρα ολόκληρα. Γιατί, όταν καλείσαι να "ζήσεις" μέσα σε έναν ζωντανό τάφο, όταν δεν έχεις πια ζωή όσο κι αν παλεύεις να την κρατήσεις, όταν από κάπου πρέπει να πιαστείς αλλά δεν ξέρεις ποιον να εμπιστευτείς και μέχρι που μπορείς να το κάνεις, το να κρατιέσαι απ' ό,τι σε κάνει να αισθάνεσαι ανθρώπινος είναι ίσως η μοναδική σου επιλογή. Η Έλλα, έχοντας μεγαλώσει μαζί με τη γιαγιά της και την αγάπη αυτής για το ράψιμο, τις κλωστές, τα υφάσματα, οτιδήποτε σχετίζεται με τη ραπτική, μια αγάπη που πέρασε στην ίδια σαν κληρονομιά, είναι αφοσιωμένη στο να εργάζεται σκληρά, παραδομένη στη μοίρα της κι αφοσιωμένη στο μοναδικό πράγμα που αγαπά και της έχει απομείνει. Δεν έχει σε κάτι να ελπίζει, δεν πιστεύει σε παραμύθια, έχει μόνο την τέχνη της. Αλλά αυτό αλλάζει όταν γνωρίζει τη Ρόουζ, που δεν είναι ρεαλίστρια όπως εκείνη. Η Ρόουζ, επηρεασμένη από την πρώην αριστοκρατική καταγωγή της, από τον τρόπο με τον οποίο μεγάλωσε και από τα δεκάδες βιβλία που έχει διαβάσει, είναι περισσότερο ονειροπόλα, μα και ιδεαλίστρια συνάμα. Πιστεύει στα όνειρα, μα την ίδια στιγμή πιστεύει και στις αξίες που δεν πρέπει κανείς να προδίδει, ειδικά όταν γνωρίζει πως είναι καταδικασμένος ό,τι και να κάνει, αρκεί να βρεθεί στον δρόμο του εκείνος που θα θελήσει να του χαρίσει την χαριστική βολή. Η αφήγηση γίνεται με τη φωνή της Έλλα, και μέσα από τα δικά της μάτια βλέπουμε να ζωντανεύει μπροστά μας κάθε γωνιά του στρατοπέδου του Άουσβιτς -με πιο ανατριχιαστική όλων, την αποθήκη φύλαξης υφασμάτων και άλλων υλικών, τα οποία κατάσχονταν από τους φυλακισμένος και μαζεύονταν εκεί προς πάσα μελλοντική χρήση. Κάθε περιγραφή της Έλλα είναι άκρως παραστατική και ζωντανή, αλλά λίγο πολύ η φρίκη του στρατοπέδου έχει αποδοθεί πολλάκις. Η κτηνωδία, όμως, που κρύβεται ανάμεσα σε αυτή την αποθήκη γεμάτη χρωματιστά υφάσματα, είναι σοκαριστικά τραγική, συναίσθημα που μεγαλώνει ακόμα περισσότερο όσο πιο πολύ το σκέφτεσαι. Γιατί δεν μιλάμε απλά για στοιβαγμένα ρούχα, αλλά για ματωμένα όνειρα, για νεκρές ζωές, για απώλειες και πληγές που δεν μπορούν να επουλωθούν, για το χειρότερο πρόσωπο του απάνθρωπου εαυτού μας που μπροστά στο "εγώ" δεν διστάζει να θυσιάσει μαζικά το "εσείς" και μέσα από μια ανομολόγητη βία, το "εμείς" ως πολιτισμός. Μοναδικό, όμως, είναι και ο τρόπος με τον οποίο η συγγραφέας αποδίδει τις "ταξικές" διαφορές, αν μπορούμε να τις χαρακτηρίσουμε έτσι, μέσα στα στρατόπεδα, με κάποιους να στέκονται ανώτερα άλλων, ξεχνώντας από που προέρχονται και για που προορίζονταν, ή ακόμα κι αψηφώντας το που μπορεί να βρεθούν την επόμενη μέρα. Και μέσα σ' έναν τόσο σκοτεινό κι επικίνδυνο μικρόκοσμο, λίγοι μπορούν να επιβιώσουν, κι αν ακόμα το καταφέρουν αυτό θα συμβεί μονάχα αν τολμήσουν, αν ρισκάρουν, αν έχουν την απαιτούμενη ευφυΐα μα και το ένστικτο που χρειάζεται προκειμένου να κάνουν τις σωστές επιλογές, τις σωστές στιγμές. Μα πάνω απ' όλα, αν μπορέσουν να τιθασεύουν το "εγώ" και το "θέλω" τους, αν δεν ξεχάσουν, αν κρατηθούν, έστω κι από μια κόκκινη μεταξωτή κορδέλα, πάνω σ' όλα όσα έχουν υπάρξει, σ' όλα όσα θέλουν να κρατήσουν καλά φυλαγμένα μέσα τους για να παραμείνουν οι ίδιοι, να μην χαθούν και να μην χάσουν τον εαυτό τους. Ένας τέτοιος άνθρωπος είναι η Έλλα και ο προσωπικό της αγώνας αξιοθαύμαστος. What a beautiful, bleak, heartbreaking yet hopeful story. Should be required reading. Full review to come! Thanks to Allen & Unwin for providing me with a review copy for this in exchange for an honest review! This was seriously fantastic. It was not at all what I expected going into it as the blurb is fairly mysterious but oh wow, this blew me away. I can't recommend this book enough; if you've read or heard of The Boy in the Striped Pyjamas then by golly you should be reading this one. Fantastic protagonist, fantastic story, unique perspective. This bo Thanks to Allen & Unwin for providing me with a review copy for this in exchange for an honest review! This book was simply phenomenal. I can’t get over it — like I’m seriously slumping over here, I can’t just move on with my life after that. WHY YOU GOTTA BE SO GOOD, BOOK? The Red Ribbon is a young adult book (that reads as though it could be children’s fiction sometimes) set during WWII. It takes place in Auschwitz, the most infamous concentration camp, and follows a girl called Ella. If you want a book that presents to you the unique perspective of a young girl in a concentration camp that rivals the standard of The Boy in the Striped Pyjamas, you’ve found it. This is your book. Ella is roughly twelve years old (I could probably look it up but hey, who has time for that). She’s alone in the camp and seems fairly naïve to start with as to why she is there. She also doesn’t seem to completely understand what the purpose of the camp is. She pretends to be sixteen and lands herself a “job” in the Upper Tailoring Studio (I think that’s its name) where she becomes a seamstress. The whole book centres around this being her passion — she loves sewing and she dreams of leaving the camp to open up her own dress shop. Ella is a very sweet character who learns quickly what it takes to survive this place. Along the way we meet three other girls: Rose, a young girl who becomes Ella’s good friend, Marta, the head of the seamstresses, and Carla, a guard. Each is different to the other and brings something worthwhile to the story. This has got to be one of my favourite books set in Auschwitz now for the brilliant way in which Adlington has brought the horrors and trials of this place to life in a very relatable way. My favourite thing about this book is the way that it’s told. The blurb on the back of the book I have doesn’t say “Auschwitz” in it and so, being told the characters were sewing for their lives and the general atmosphere of the blurb (if a blurb can have an atmosphere) I assumed I was diving into an epic fantasy story. Yeah, no. But I loved that, surprisingly. It’s a very real way of approaching the story. Adlington doesn’t name-drop Auschwitz until a couple of chapters in. It made me realise just how much I love not knowing anything until the story gets going. It also meant that I gasped audibly, catapulted the book across the room and ran around the house going THIS WAS UNEXPECTED with dramatic flailing arms. That’s a good thing, I promise. The fact that it’s coming from Ella’s perspective and she is not in the know about everything that is happening makes it a really user-friendly read of what the camp was like. We find things out slowly through her character, so there is no excessive info-dump or overwhelming political confusions. She’s in a camp, she has to be able to sew or she’ll die, she has to stand during roll call (and is pleased if it is not “interrupted” by someone falling over dead) and if she plays the game right, she must just make it out alive. The absolute best part about this book, however, is the lack of labels. This was an intentional thing done by Adlington for extremely well thought out reasons. The words “Nazi” and “Jew” are never used to describe the characters. Ella wears a star, which we as readers know to mean she is a Jew, but it’s only ever explained as her crime being who she was. Rose has a red badge and Ella knows that to mean she is a political prisoner (but still doesn’t fully understand that). Why is this so clever? Because Adlington 100% achieves what she was aiming to by doing this. By deliberately not using labels, the characters instantly become relatable. I see a young girl who has done nothing wrong and didn’t make it home from school one day when the “guards” came and took her away to that place. I can relate to that; she’s just a girl and her crime was being her. When you slam down labels such as Jew, my brain takes a back seat and doesn’t stress so much over the character’s dilemmas, not deliberately, but simply because that character could not have been me. In addition to this, it makes the other plot aspect that Adlington is angling for, work. She has four girls and the idea is that they could have been friends if it weren’t for the war. I think if labels had been used and Carla, the guard, had been called a Nazi, it would have just been a little harder to imagine that. But guard is an inoffensive term and therefore I can make the leap, just a bit easier. I loved having the four very diverse characters for other reasons, too. As they were so different, we were able to see the different types of people and how they responded the situation they found themselves in. It was a good way of showing just how wonderful Ella is given that throughout her ordeal, the integrity of her characters holds fast. AND, she holds onto her dream. I loved this. So now, let’s discuss some specifics. But before I do, I want to start this section by saying that I absolutely adored the ending. It was so refreshing to read a book with this sort of setting and have the happiest ending you could have hoped for — without it being too unrealistic. Rose totally stole the show of of this book. I loved the stories she told all the women but most importantly I loved how she ignored everyone’s snide comments against her and just was who she was the entire time. Her positivity was incredible — I hope someone makes this book into a film because it would honestly be amazing. I was beyond pleased that she survived. I thought she really had died when the hospital was cleared out. The slow build up to her becoming sick had me nervous the entire time. I was so sad when it was just Ella by herself — but that being said, Rose’s disappearance gave Ella the strength to go on and survive to get out. When Rose turned up at the park I just couldn’t believe that was her, I thought that was a magnificent twist. I’m so pleased that the two of them got to open up their shop, it was marvellous. I loved the focus on dressmaking throughout the book. I think it really helped to not make the horrors of the camp too overwhelming. Granted, this book is not really focusing on those aspects too much anyway. The Red Ribbon is definitely hedging for a more innocent approach to the concentration camps. So the way that we follow Ella’s passion from the tailoring shop all the way to her fixing clothes for the farmer who takes her in and eventually to opening her shop, was incredible. It just fitted into the story so nicely. I also thought it gave a nice added element to Ella’s character because of the way she spirals off in her thoughts. I’m sure there is more to be analysed there by how swiftly she gets distracted — I certainly find it relatable in a funny way, jumping from one topic to a next in obscure ways — but I can’t be bothered with the headache of breaking it down. The complications of Ella wanting to make a perfect dress and prove what she could do in opposition to the desire to not be making anything for their oppressors was an interesting battle. It was a nice touch for adding that extra complication into the plot line. One of the other elements I thought was also well done was the mental state of each of the characters. Marta is the strongest out of them all, in her own way, as she blocks out emotions to keep her wits together and make it through to the end. Rose deals with conflict and hardship by using stories as an escape. Ella is frequently distracted and imagines dresses she could make as a way of intentionally distracted herself from what was going on. The most interesting character is definitely Carla. I immediately disliked her but I thought the glimpses into her mental state were more than interesting. The way in which she uses Ella’s presence as a way for making up for company, even though she is completely cruel in flashing around all the privileges she has. What was most interesting and probably a good look at Nazi soldier’s mentality, was the way in which she viewed herself as a good soldier, one who wasn’t particularly cruel — even though she then crushes Ella’s hand under her boot without a second thought. Not to mention when she shoots Ella as the end of the book. I highly recommend this book to anyone out there who finds war stories interesting. If you liked The Boy in the Striped Pyjamas then certainly read this one! It’s really well executed with such an interesting plot line and an extremely interesting way of telling the story. "The Red Ribbon" is an excellent ya novel covering some of the lesser known aspects of life in concentration camps. It also presents several types of "prisoners" not often covered. The brutality is not withheld and the harsh truth of what it took to survive is on full display. My heart was broken several times throughout, and I feel like I learned quite a bit. Highly recommended. This review is based upon a complimentary copy provided by the publisher in exchange for honest feedback. 4.5⭐read! I’d never heard of this book, but it was selected as this month’s book group choice and I’m very glad it was. This is a brilliantly written mix of fact and fiction set during the Holocaust, about 14 year old girls Ella and Rose (and friends) in one of the most infamous death camps during the 2nd world war. Very few books make me openly emotional, this is one of them. 4.5⭐️read! I’d never heard of this book, but it was selected as this month’s book group choice and I’m very glad it was. This is a wonderful blend of fact and fiction, detailing some of the on-goings during 1944-45 from the Auschwitz-Birkenau extermination camp complex. It mostly focuses on Ella, a young girl who is working as a dressmaker in a clothing factory in Birchwood (Birkenau). We see Ella's journey from the moment she arrives at Birchwood, through to her struggles to stay alive but also her internal battle to decide what she should, or shouldn't, do for others. For me what was most interesting is that thi This is a wonderful blend of fact and fiction, detailing some of the on-goings during 1944-45 from the Auschwitz-Birkenau extermination camp complex. It mostly focuses on Ella, a young girl who is working as a dressmaker in a clothing factory in Birchwood (Birkenau). We see Ella's journey from the moment she arrives at Birchwood, through to her struggles to stay alive but also her internal battle to decide what she should, or shouldn't, do for others. For me what was most interesting is that this story really showcases what people will do to survive when in their lives beforehand they would never have contemplated some of the choices they make in the factory. Who you might be when you are coming into a working camp may not be who you become once you settle in. Equally, I liked how well Adlington captured that it is impossible to judge someone for doing the unthinkable to survive, even if at first they seem the most kind-hearted individual and even if we cannot understand their rationale; even if they are the enemy. None of it matters; each character, even the "bad guys" showcases a different kind of person, and the choices that they make because they wanted to live or wanted to protect another. It's a really beautiful and complex representation of human nature, in a way that many other stories of this kind haven't always portrayed. Many of the relationships within this book are equally as complex as the ideas within. Ella builds a strong friendship with another girl, Rose, who lives and works with her in Birchwood. Their friendship is a lovely part of the story, but also an interesting element to imagine - would you, when you yourself are starving, share your every scrap with another? Would you barter for something someone else needs and put yourself at risk in doing so? Lots of Ella's personality traits and decisions really made me think but also helped me picture what tough choices people had to make. I think this story is important. And whilst it is horrific and filled with brutal depictions of moments that most likely, or most definitely, did happen during this period, it is also uplifting, filled with hope and perfectly shows that even in the worst of moments there is always a little something left in us to keep going. I loved it and I absolutely recommend it. I would like to thank Netgalley and the publisher, Hot Key Books, for providing me with this ARC. Okay, this one has been compared to the Boy in the Striped Pajamas, which I have never read. The Red Ribbon is set at Auschwitz, which is one of the worst concertation camps. Ella has found herself a job there-as a seamstress. Finding a job is about the only way she can stay alive; I think we all know what happens to those who cannot work. So, anyway, Ella. I loved her character. No matter what happens, she finds a way to hold onto the good in life, which is mostly inspired by her best friend, Rose. The girls really do seem like normal girls doing normal things-expect they are at Auschwitz. Her point of view is extremely strong. Lucy casually mentions things from Ella’s past and sometimes you don’t always catch it. It really hits you hard and makes you really think about history. It just brings the horrors to life. Rose was the one who held everything together. I really do think that without her, Ella would not had come as hard as she did. Rose is so sweet and caring, yet loyal and strong. She kind of reminded me of that person who enters the room and puts a smile on your face. I just found myself cheering her on. The writing was beautiful and emotional. The last book that hit me like this emotionally was The Radium Girls. Those of you who have read it, know what I’m talking about. The Red Ribbon is one of those books that makes you stop and think. It really makes you question what is going on in the world. Granted, The Red Ribbon is modern, but it still makes you stop and think. Lucy does a wonderful job at writing about something that is kind of a touchy subject. Most Holocaust books are kind of genetic with the same plotline, but this one really hits home. Though the characters are not real, you find yourself clinging to them and wondering what happens to them. You laugh, you cry, and you for them. To make you feel that way, requires a very talented author. The Red Ribbon is a painfully gorgeous story that demands to be heard. It ripped me apart and threaded me together with a new perspective by the end. I will never think of clothes the same way again. Set in the Auschwitz concentration camp near the end of WWII, 14-year-old Ella dares to dream and create beauty in the ugliest place in history. Tenacious, intelligent, courageous, and passionate, Ella is endearing and inspiring as she withstands her harsh environment sewing high fashion clothing for The Red Ribbon is a painfully gorgeous story that demands to be heard. It ripped me apart and threaded me together with a new perspective by the end. I will never think of clothes the same way again. Set in the Auschwitz concentration camp near the end of WWII, 14-year-old Ella dares to dream and create beauty in the ugliest place in history. Tenacious, intelligent, courageous, and passionate, Ella is endearing and inspiring as she withstands her harsh environment sewing high fashion clothing for the Nazi elite where her life hangs on every stitch. She has the most delightful friendship with Rose who is storybook sunshine and an emotional anchor for Ella despite the terror and destruction surrounding them. Marta is a fellow prisoner and ‘boss’ of the sewing shop and Carla is a guard and client of the sewing shop. The moral greyness of their characters is intriguing and believable as their complex relationships with Ella examine the poisoned heart of the Holocaust beyond the historical facts and statistics. It in no way diminishes those important details, but it focused on individual choices and emotions, allowing me to see a different aspect of the tragedy. The author stated at the end of book that her goal was to show acts of kindness as heroism and how it can bring us together to defeat hatred and violence. She accomplished her task with exquisite skill. The beacon of hope at the core of this story is uplifting and empowering. It is a worthwhile read, especially for classes studying this topic. When I first started reading this book, I had forgotten that it was about the Holocaust. It read, if you didn't know better, like a future dystopia, where children were grabbed off the street and forced to work at whatever they could, in a place away from the rest of the world. Part of this is sort of on purpose, because to make us truly see how horrible this is, the author always refers to Birkenau as Birchwood, which is the translation of the word into English. She refers to Paris as the City o When I first started reading this book, I had forgotten that it was about the Holocaust. It read, if you didn't know better, like a future dystopia, where children were grabbed off the street and forced to work at whatever they could, in a place away from the rest of the world. Part of this is sort of on purpose, because to make us truly see how horrible this is, the author always refers to Birkenau as Birchwood, which is the translation of the word into English. She refers to Paris as the City of Light. She wants, I expect, to see if she can bring us fully into the story, into the horror that were the concentration camps, but removing the language that we are used to. And it works. Although this is fiction, it is based on fact, that there really was a contingent of women sewing for the commandant, and his wife, and the officers, while the ovens and the gas chambers happened all around them. Very good, sad story. But hope is always there. Very realistic. I normally really like books on the Holocaust but I can’t say I liked this one much. The author basically tried to write a heartwarming story set in Auschwitz and I don’t really think that’s possible; the result felt sappy and fake. Calling the place Birchwood instead of Birkenau confused me, and it was never made clear where the characters were from (except for Rose, I’m guessing “City of Light” meant Paris) or what language(s) they were speaking. The character of Henrik and the thread about a possible escape seemed to go nowhere. And without giving away the ending, it seemed unbelievably happy — I could not suspend disbelief that either of those characters would have survived. I really enjoyed this book, it deals with an incredibly sensitive topic extremely well. It is perfectly pitched for middle grade and above. The characters are believable but a little underdeveloped, I thought. However, I think the author has created an incredible story and I would highly recommend. Have already passed it on for others to read. Four of us: Rose, Ella, Marta and Carla. In another life we might all have been friends. But this was Birchwood. I won a copy of this book via Readers First and I wish I got around to this sooner! It’s a YA, Historical Fiction which is set back when WW2 was happening, however we see the concentration camps. The Red Ribbon is a mix of truth and fiction, Lucy Adlington tells us in the afterword that it is based in a real place ‘Birchwood’ which she translated from Birkena 4.5 STARS! It’s a YA, Historical Fiction which is set back when WW2 was happening, however we see the concentration camps. The Red Ribbon is a mix of truth and fiction, Lucy Adlington tells us in the afterword that it is based in a real place ‘Birchwood’ which she translated from Birkenau, the German word. This book is set in a vast labour and extermination camp complex called Auschwitz-Birkenau, in Poland. I honestly didn’t know much about what happened in concentration camps as it wasn’t something I was taught about much or seen anywhere. This book has been an eye opener, and I highly recommend it, it was beautifully written, I loved the characters in the story, we follow a girl named Ella and how she deals with life in Birchwood and her new best friend Rose, I just adored their friendship, how they’re both there for each other and look after one another. Marta was okay, I don’t have much to say about her, she just looks out for herself pretty much and Carla, you guys will find out if you read this book. It was a beautiful ending, I had to hold myself back from sobbing because it was just so, ugh, wonderful! I still want to know a little bit more, even though the ending satisfied me, I wanna know what happened to a few of the other characters that were in this book. One moment Ella was walking home from school, the next she has been rounded up by the Nazis because of her yellow star and transported to the concentration camp Birkenau, or Birchwood, as the author calls it. Luckily she is a superb seamstress and is able to get a The Red Ribbon by Lucy Adlington, 264 pages. Candlewick, 2018. $18. I write YA fiction, including The Diary of Pelly D, Burning Mountain and Night Witches. My new novel The Red Ribbon drew on my interest in WW2 history. It is inspired by the true stories of the dressmakers of Auschwitz. Since writing The Red Ribbon I have been contacted by families of survivors, including two of the original seamstresses who survived Auschwitz by literally sewing for their lives. I write YA fiction, including The Diary of Pelly D, Burning Mountain and Night Witches. My new novel The Red Ribbon drew on my interest in WW2 history. It is inspired by the true stories of the dressmakers of Auschwitz. Since writing The Red Ribbon I have been contacted by families of survivors, including two of the original seamstresses who survived Auschwitz by literally sewing for their lives. Amazing. 'I want to go home!' the poor woman gasped, in between shakes and sobs.